I thought I was over making holiday layouts, but apparently I still have Christmas Spirit. I'm not sure how much longer it will last, but I'll take full advantage of it while it's still flowing. I finished up a layout tonight with a photo of my son on his 1st Christmas morning. The first year we bought our home, we didn't have much extra money. That year for Christmas, I bought all of Cole's gifts from the thrift store and from yard sales. I started a few month before the holiday and really had quite a collection. It was so much fun to hunt down little treasures instead of going to the store and buying something brand new. I've been a "thrifter" my whole life and love digging through piles of junk to find the "diamond in the rough". To get my creative juices flowing, I participated in a challenge over at The Paper Girls Challenge. The theme was ornaments for Challenge #70. 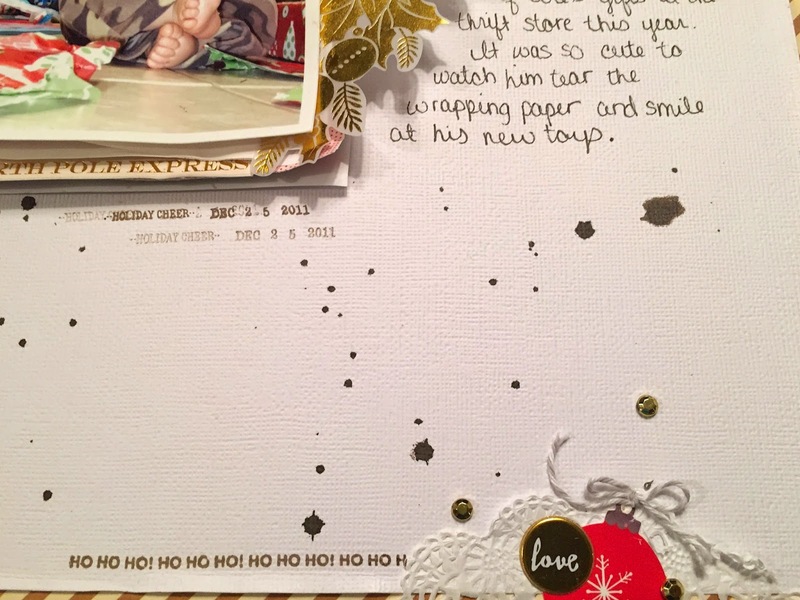 You can create your own ornament, make a layout or December album page about ornaments, use ornament paper, stamps or embellishments on a layout or card. To follow with the ornament theme, I used a piece of ornament paper and also used an ornament sticker at the bottom of my page. Are you still making holiday layouts or crafts? Or are you sick of the mumbo-jumbo?